A sexual assault two years ago left Lake with physical and psychological trauma. She damaged her knees while fighting off her attacker, who had broken into her home. Although she managed to escape, her knees never recovered. At times, the sharp pain drove her to the emergency room. Lake's job, which involved loading luggage onto airplanes, often left her in misery. "I thought the knee replacement was going to be a cure," said Lake, now 52 and living in rural Iowa. "I got all excited, thinking, 'Finally, the pain is going to end and I will have some quality of life.'" But one year after surgery on her right knee, Lake said she's still suffering. "I'm in constant pain, 24/7," said Lake, who is too disabled to work. "There are times when I can't even sleep." But Lake's ordeal illustrates the surgery's risks and limitations. Doctors are increasingly concerned that the procedure is overused and that its benefits have been oversold. Research suggests that up to one-third of those who have knees replaced continue to experience chronic pain, while 1 in 5 are dissatisfied with the results. A 2017 study published in the BMJ found that knee replacement had "minimal effects on quality of life," especially for patients with less severe arthritis. 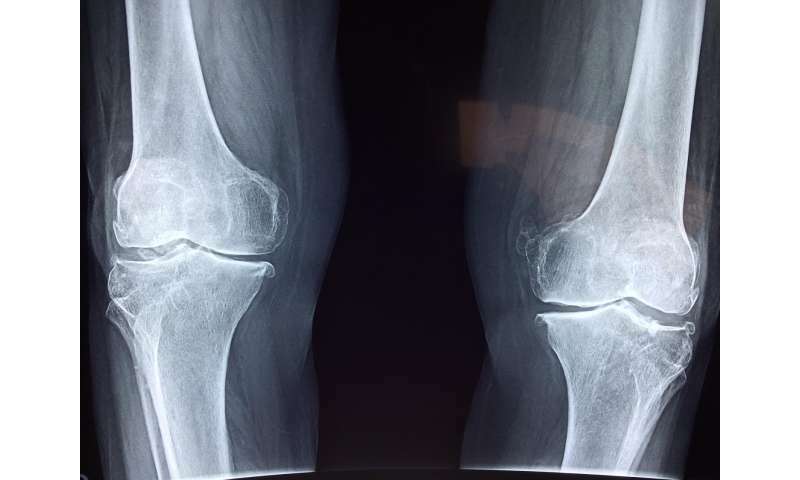 One-third of patients who undergo knee replacement may not even be appropriate candidates for the procedure, because their arthritis symptoms aren't severe enough to merit aggressive intervention, according to a 2014 study in Arthritis & Rheumatology. "We do too many knee replacements," said Dr. James Rickert, president of the Society for Patient Centered Orthopedics, which advocates for affordable health care, in an interview. "People will argue about the exact amount. But hardly anyone would argue that we don't do too many." Although Americans are aging and getting heavier, those factors alone don't explain the explosive growth in knee replacement. The increase may be fueled by a higher rate of injuries among younger patients and doctors' greater willingness to operate on younger people, such as those in their 50s and early 60s, said Rickert, an orthopedic surgeon in Bedford, Ind. That shift has occurred because new implants can last longer—perhaps 20 years—before wearing out. Yet even the newest models don't last forever. Over time, implants can loosen and detach from the bone, causing pain. Plastic components of the artificial knee slowly wear out, creating debris that can cause inflammation. The wear and tear can cause the knee to break. Patients who remain obese after surgery can put extra pressure on implants, further shortening their lifespan. The younger patients are, the more likely they are to "outlive" their knee implants and require a second surgery. Such "revision" procedures are more difficult to perform for many reasons, including the presence of scar tissue from the original surgery. Bone cement used in the first surgery also can be difficult to extract, and bones can fracture as the older artificial knee is removed, Rickert said. Yet hospitals and surgery centers market knee replacements heavily, with ads that show patients running, bicycling, even playing basketball after the procedure, said Dr. Nicholas DiNubile, a Havertown, Pa., orthopedic surgeon specializing in sports medicine. While many people with artificial knees can return to moderate exercise—such as doubles tennis—it's unrealistic to imagine them playing full-court basketball again, he said. "Hospitals are all competing with each other," DiNubile said. Marketing can mislead younger patients into thinking, "'I'll get a new joint and go back to doing everything I did before,'" he said. To Rickert, "medical advertising is a big part of the problem. Its purpose is to sell patients on the procedures." Rickert said that some patients are offered surgery they don't need and that money can be a factor. Knee replacements, which cost $31,000 on average, are "really crucial to the financial health of hospitals and doctors' practices," he said. "The doctor earns a lot more if they do the surgery." Yet surgery isn't the only way to treat arthritis. "At this point, I thought I would be getting a second knee done, not redoing the first one," Williams said. Other patients, such as Ellen Stutts, are happy with their results. Stutts, in Durham, N.C., had one knee replaced in 2016 and the other replaced in 2018. "It's definitely better than before the surgery," Stutts said. Inappropriate treatment doesn't harm only patients; it harms the health care system by raising costs for everyone, said Dr. John Mafi, an assistant professor of medicine at the David Geffen School of Medicine at UCLA. To avoid inappropriate joint replacements, some health systems are developing "decision aids," easy-to-understand written materials and videos about the risks, benefits and limits of surgery to help patients make more informed choices. Blue Shield of California implemented a similar "shared decision-making" initiative. Because the devices can wear out in as little as a few years, a younger person could outlive their knees and require a replacement, Garlich said. But "revision" surgeries are much more complicated procedures, with a higher risk of complications and failure. "Patients think after they have a knee replacement, they will be competing in the Olympics," Garlich said. Danette Lake once planned to undergo knee replacement surgery on her other knee. Today, she's not sure what to do. She is afraid of being disappointed by a second surgery. Sometimes, she said, "I think, 'I might as well just stay in pain.'"